An unexplainable phenomenon of people bursting into flames assails humanity. Put your life on the line to extinguish the flames! A great conflagration that will shake up the manga world! A sci-fi firefighting battle! Popular manga author Atsushi Ookubo comes to Weekly Shonen Magazine #43 with a fun and fiery series, Enen no Shouboutai (Fire Brigade of Flames). For those unware, Ookubo is the manga author of hit series Soul Eater. The anime adaption helped greatly with its popularity internationally and was listed as the sixth best anime by the Los Angeles Times. Enen no Shouboutai was a highly anticipated series since rumours were heard of Ookubo working on a new series. 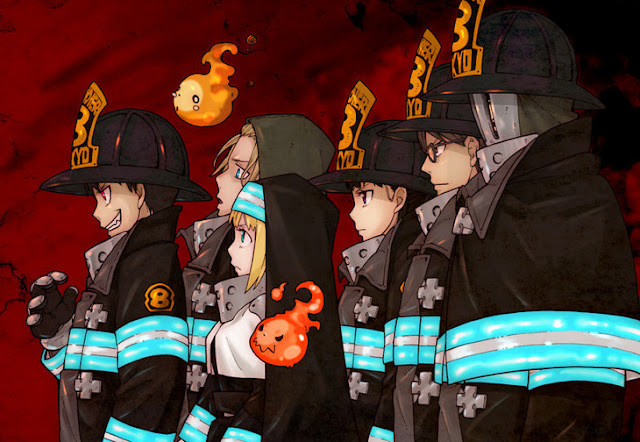 The story follows Shinra Kusakabe and the Fire Brigade of Flames as they combat dangerous 'Flame People'. All members of the Brigade have differnt types of abilities to fight the flames. Shinra himself is a Flame Person (of sorts), fighting to find the individual responsible for his family's death. Enen no Shouboutai will surely be a fun and slightly crazy series for many to enjoy.